Royal Dutch Shell, the largest company in the world in terms of revenues, is headquartered in The Hague, Netherlands and would be the pride of any nation, were it not for its ethical lapses in Africa. 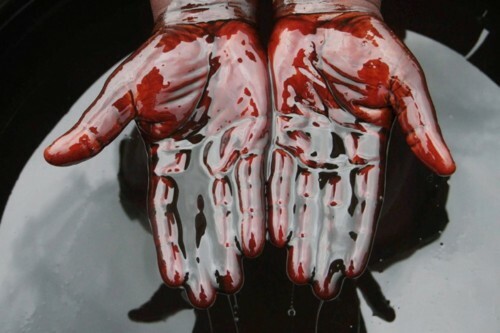 For fifty years, Shell has exploited Nigerian oil and what of it? exploitation is defined by those in power. Another useless and whining complaint of environmental abuse. Get over it, look the other way, fill up your car and realize it’s not your issue, isn’t happening in your country and you can’t save every hopeless situation in the world. One wonders what Queen Beatrix thinks of all the negative publicity in such a case, finally brought to court after decades on behalf of four Nigerian farmers. Perhaps it is beyond her attention or, as they are wont to say in business, above her level of authority. Still, as reigning monarch, there are no levels of ethical behavior above the Queen. She’s a lovely lady, a beloved monarch and it’s not my intention to show her in any other than a favorable light. It is my intention to point a finger toward the difference between what is right and what is legal. 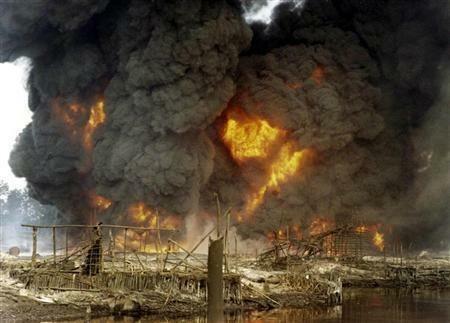 We’re losing control over that across the world and Shell-Nigeria is a poster-child for that loss. Of critical importance to this commentary is that everything Shell has done is legal. The courts have found it so. This is a spill-story, although it’s not event-oriented as were the EXXON-Valdez and BP Gulf of Mexico disasters. This is a 50-year trickle-down story of sensational profit and environmental neglect, abetted by a systematic half-century purchase of favor (some would say wholesale bribery) within the various Nigerian governments, now presided over by Goodluck Jonathan. Good luck indeed, to his nation’s oil-rich and withering social fabric. But, all that aside, Nigeria is Africa’s largest nation, with nearly half the population of the U.S. and the 39th largest economy in the world, nearly all of it oil-derived—quite an achievement for Shell, who essentially runs the country. With that favored-corporation sphere of influence, Shell has chosen to abandon all other responsibilities. Corporations, as we have been told—and reluctantly accept—are run for the benefit of shareholders. Social, environmental and human-rights responsibilities be damned. All stories are ultimately about people and the Ogoni people of the Niger Delta in Nigeria are losing this fight to save their agricultural and cultural heritage. Heritage is an almost unknown word in modern times, but hardly irrelevant. This area of Africa has seen human habitation since 9,000 years before Christ and the humble Ogoni predate him as well. Recent events are unfathomable to them in any meaningful context. …In a 15 year period from 1976-1991 there were reportedly 2, 976 oil spills of about 2.1 million barrels of oil in Ogoniland, accounting for about 40% of the total oil spills of the Royal Dutch/Shell company worldwide. 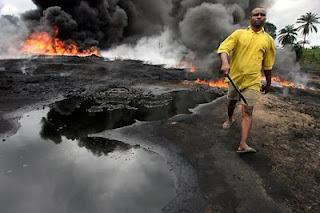 In an assessment of over 200 locations in Ogoniland done by the United Nations Enviornment Programme (UNEP), they found that the 50 years of oil production in the region extended deeper than some may have predicted. Because of oil spills, oil flaring, and waste discharge, the once alluvial soil of the Niger Delta is no longer viable for agricultural use and attributes to wide spread land degradation. Furthermore, in many areas which seemed to be unaffected, groundwater tested to have high levels of hydrocarbons or were contaminated with benzene, a carcinogen, at 900 levels above WHO guidelines. They haven’t a prayer of winning of course and that both is and isn’t the point. The point is not legal, as Royal Dutch Shell has shown itself to be very skilled in the machinations of shell corporations (no pun intended), adept at evading evidence of culpability in this environmental and human disaster. They will win and if they don’t win they will appeal, which is merely another form of winning. The point is the ethics of inhabiting this planet, removing its resources and leaving total human and environmental destruction behind for profit. The point is the ethics of a 106 year old corporation ravaging an 11,000 year old habitation and walking off scot free. Those who don’t learn ethics at their mother’s knee, must learn it elsewhere or turn in their ticket for running the world’s largest and most profitable corporation. Otherwise we are truly lost and the wheels will come entirely off public trust. Peter Voser, CEO of Royal Dutch Shell may be such a man without ethics, but the evidence is circumstantial. The Netherlands’ Queen Beatrix Wilhemina Armgard is ethical beyond reproach and of sufficient years to mother this middle-aged, ethically impaired miscreant. I propose (as if I had even the slightest power to do so) the Queen sit down to tea with Peter and have a chat about life and what one leaves behind when that life is over. I’m not sure they’ve ever met, but those are the sorts of things mothers teach their young, the stories and parables that impart a sense of ethics. 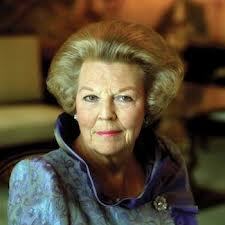 Beatrix has no power over Royal Dutch Shell, or Peter for that matter. The Netherlands is a parliamentary monarchy. It is her moral authority that matters. Possibly in the interim between tea and some lovely sort of Dutch pastry, she might inquire of the Chief Executive Officer if doing the profitable thing and doing the right thing are mutually incompatible. It would all be quite friendly and he might even convince her they are.